■ Capsules. 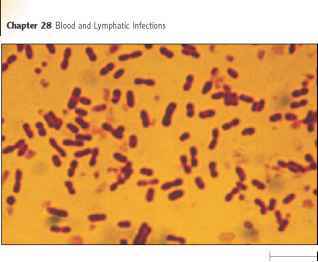 Capsules have long been recognized for their ability to prevent phagocytosis. Often, they interfere with the alternative pathway of complement activation. They do this by binding to host cell complement regulatory proteins that inactivate C3b that has bound to a surface; this mechanism is identical to that described earlier for serum-resistant bacteria (see figure 19.8). Rapid inactivation of C3b also prevents it from being an effective opsonin. 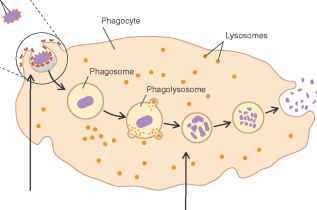 Streptococcus pneumoniae is an example of an organism that produces a capsule that prevents phagocytosis (figure 19.10). ■ M protein. This component of the cell wall of Streptococcus pyogenes functions in a manner similar to that of the Streptococcus pneumoniae capsule; it binds to a complement regulatory protein that inactivates C3b, interfering with complement activation and the subsequent formation of more C3b. Rapid inactivation of C3b also prevents it from being an effective opsonin.